HERE is a computer simulation study of how a dilute solution of different `chemical' species can spontaneously begin to capture energy and create non-random structures (cf life). A chemical mixture that continually absorbs work from its environment may exhibit steady-state chemical concentrations that deviate from their equilibrium values. Such behavior is particularly interesting in a scenario where the environmental work sources are relatively difficult to access, so that only the proper orchestration of many distinct catalytic actors can power the dissipative flux required to maintain a stable, far-from-equilibrium steady state. 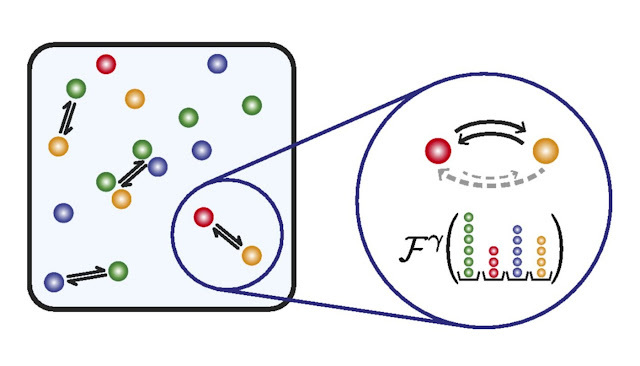 In this article, we study the dynamics of an in silico chemical network with random connectivity in an environment that makes strong thermodynamic forcing available only to rare combinations of chemical concentrations. We find that the long-time dynamics of such systems are biased toward states that exhibit a fine-tuned extremization of environmental forcing.